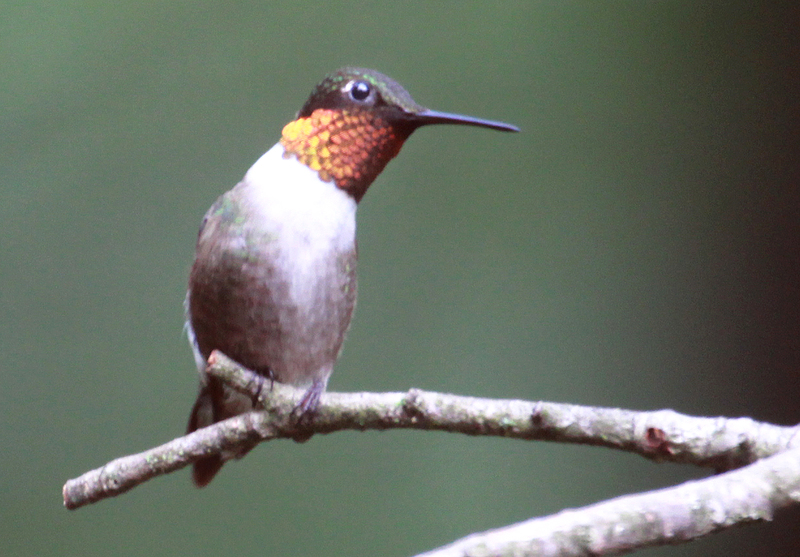 A ruby-throated hummingbird perches on a stick being used as a garden stake in New England, summer 2018. One of the nice things about living in the woods is that you are never at a loss for garden stakes. Does that tomato plant need support? Take a little walk in the backyard, find a thin but sturdy stick on the ground, and you’ve got yourself a garden stake. Sure, it’s not apt to be perfectly straight, and it might not sport a perfectly pointed end for jabbing into the soil, but that’s nothing a whittle or two with a jackknife can’t fix. A bonus to using these natural garden stakes, I’ve noticed, is that if they are placed near a birdfeeder, they make for good perches, too. This is especially true if the sticks have smaller branches at the top.